Not all hydrocarbons are straight chains. Many hydrocarbons have branches of C atoms attached to a chain; they are called branched hydrocarbons. These branched alkanes are isomers of straight-chain alkanes having the same number of C atoms. However, they are different compounds with different physical and chemical properties. As such, they need different names. How do we name branched hydrocarbons? There are a series of rules for naming branched alkanes (and, ultimately, for all organic compounds). These rules make up the system of nomenclature for naming organic molecules. Worldwide, the International Union of Pure and Applied Chemistry (IUPAC) has developed the system of nomenclature for organic compounds, so these rules are sometimes called the IUPAC rules of nomenclature. By learning and applying these rules, you can name any organic compound when given its structure or determine the unique structure of a molecule from its name. You have already learned the basics of nomenclature—the names of the first 10 normal hydrocarbons. Here, we will add some steps to the procedure so you can name branched hydrocarbons. First, given the structure of an alkane, identify the longest continuous chain of C atoms; this is known as the parent chain. Note that the longest chain may not be drawn in a straight line. The longest chain determines the parent name of the hydrocarbon. 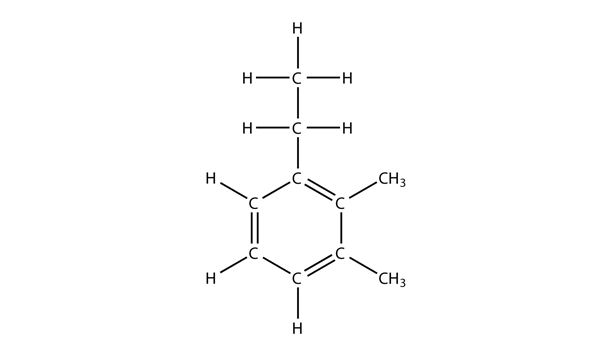 For example, in the molecule shown below, the longest chain of carbons has six C atoms. Therefore, it will be named as a hexane. However, in this molecule, the longest chain of C atoms is not six, but seven, as shown. 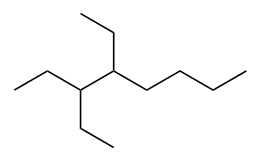 So this molecule will be named as a heptane. The next step is to identify the branches, or substituents, on the main chain. The names of the substituents, or alkyl groups, are derived from the names of the parent hydrocarbons; however, rather than having the ending –ane, the substituent name has the ending –yl (Table 16.2 “Substituent Names for the Five Smallest Substituents.”). To name a branched hydrocarbon, the name of the substituent is combined with the parent name of the hydrocarbon without spaces. However, there is likely one more step. The longest chain of the hydrocarbon must be numbered, and the locant (numerical position of the substituent) must be included to account for possible isomers. As with double and triple bonds, the main chain is numbered to give the substituent the lowest possible number. For example, in the alkane shown here, the longest chain is five C atoms long, so it is a pentane. It is understood that any unwritten covalent bonds are bonds with H atoms. With this understanding, we recognize that the structural formula for 3-methylpentane refers to a molecule with the formula C6H14. The longest continuous carbon chain has seven C atoms, so this molecule is named as a heptane. There is a two-carbon substituent on the main chain, which is an ethyl group. To give the substituent the lowest numbering, we number the chain from the right side and see that the substituent is on the third C atom. So this hydrocarbon is 3-ethylheptane. Branched hydrocarbons may have more than one substituent. If the substituents are different, give each substituent a number (using the smallest possible numbers) and list the substituents in alphabetical order, with the numbers separated by hyphens and no spaces in the name. So the molecule shown here is 3-ethyl-2-methylpentane. If the substituents are the same, use the name of the substituent only once, but use more than one number, separated by a comma. Also, put a numerical prefix before the substituent name that indicates the number of substituents of that type. The numerical prefixes are listed in Table 16.3 “Numerical Prefixes to Use for Multiple Substituents.” The number of the position values must agree with the numerical prefix before the substituent. The longest chain has four C atoms, so it is a butane. There are two substituents, each of which consists of a single C atom; they are methyl groups. The methyl groups are on the second and third C atoms in the chain (no matter which end the numbering starts from), so we would name this molecule 2,3-dimethylbutane. Note the comma between the numbers, the hyphen between the numbers and the substituent name, and the presence of the prefix di– before the methyl. Other molecules—even with larger numbers of substituents—can be named similarly. Alkenes and alkynes are named in a similar fashion. The biggest difference is that when identifying the longest carbon chain, it must contain the C–C double or triple bond. Furthermore, when numbering the main chain, the double or triple bond gets the lowest possible number. This means that there may be longer or higher-numbered substituents than would be allowed if the molecule were an alkane. For example, this molecule is 2,4-dimethylhept-3-ene (note the number and the hyphens that indicate the position of the double bond). The longest chain that contains the C–C triple bond has six C atoms, so this is a hexyne molecule. The triple bond starts at the third C atom, so this is a hex-3-yne. Finally, there are two methyl groups on the chain; to give them the lowest possible number, we number the chain from the left side, giving the methyl groups the second position. 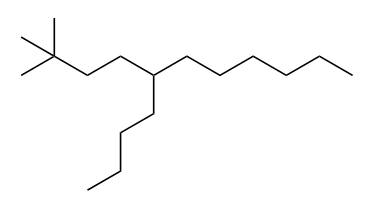 So the name of this molecule is 2,2-dimethylhex-3-yne. 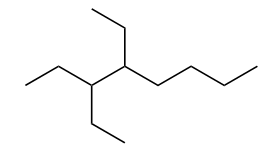 Draw the carbon backbone for 3-ethyl-6,7-dimethyloct-2-ene. A unique name can be given to branched hydrocarbons using IUPAC nomenclature rules. 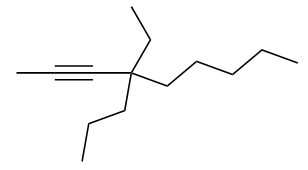 A unique structure can be drawn for the name of a given hydrocarbon. Bond-line diagrams are commonly used to represent organic molecules and simplify the structure by not showing C-H bonds or carbon atoms. 14. Draw the carbon backbone for each molecule. 15. Draw the carbon backbone for each molecule. 16. Draw the carbon backbone for each molecule. 17. 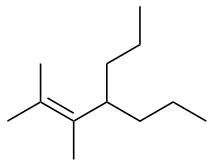 The name 2-ethylhexane is incorrect. 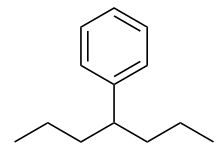 Draw the carbon backbone and write the correct name for this molecule. 18. The name 3-butyl-7-methyloctane is incorrect. 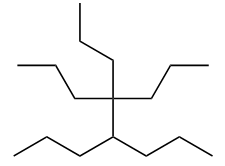 Draw the carbon backbone and write the correct name for this molecule. 1. A branched hydrocarbon does not have all of its C atoms in a single row. Branched Hydrocarbons by David W. Ball and Jessie A. Key is licensed under a Creative Commons Attribution-NonCommercial-ShareAlike 4.0 International License, except where otherwise noted.